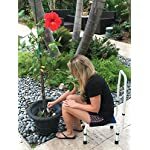 Home / Essentials / Step Stools / AdjustaStep(tm) Deluxe Step Stool/Footstool with Handle/Handrail, Height Adjustable. 2 products in 1. Modern white/blue design. New for 2016. What good is a step stool that is too high to comfortably and safely step up to; or one that is too low to accomplish the task at hand? No fixed height step stool can solve these problems. 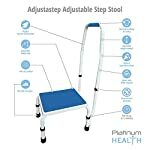 The new AdjustaStep is the first and only step stool with handle that can be perfectly customized in seconds and without tools. 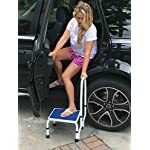 Safer, more versatile and more visually appealing than any step stool available, the AdjustaStep features a non slip platform, non slip base, all steel construction and a beautiful, durable, easy to clean powder coated finish. 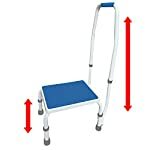 Easily and quickly converts from a stool with handrail to a stool without. 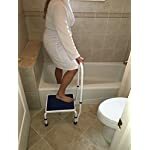 Ideal for the elderly, the disabled, children or any user looking for the perfect step stool. AdjustaStep is NOT MADE IN CHINA and has no offensive off-gassing odors commonly found in made-in-china step stools! 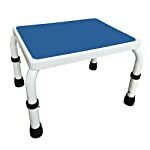 Dimensions:The platform has 3 height settings (top of step to the floor distance). They are as follows: 8.5″, 9.5″ and 10.5″. 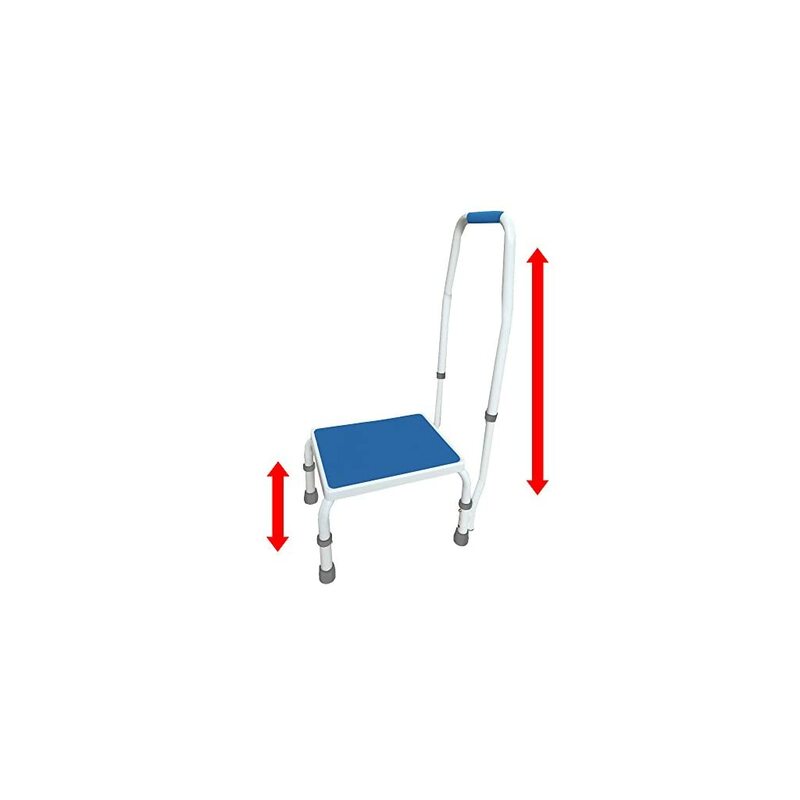 The top of handle distance from the floor can be adjusted from 31.5″ to 33.5″. Platform dimensions are 13.75″x 11.25″. Max. 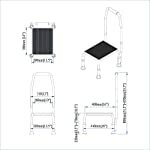 weight capacity: 300lbs ***IMPORTANT*** REVIEW PRODUCT DIMENSIONS CAREFULLY BEFORE ORDERING- CLICK ON THE THUMBNAIL IMAGES TO FIND THE LINE DRAWING WITH DETAILED DIMENSIONS. 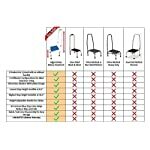 ***IMPORTANT*** REVIEW PRODUCT DIMENSIONS CAREFULLY BEFORE ORDERING- CLICK ON THE THUMBNAIL IMAGES TO FIND THE LINE DRAWING WITH DETAILED DIMENSIONS.